Heading into the new year the ponies and I have been busy. At the start of January we travelled down to Cornwall to try out a 14.2hh pony. We weren’t really looking to get another one just yet but Mummy really liked the look of him. We all loved him straight away and although he is quite green he has the nicest temperament and personality. So Smartie is now my new project pony to produce and hopefully event next year. He was a bit unsettled for the first few days when we got him home and the change in environment and feed etc made his droppings very runny so we put him on Dengie Healthy Tummy, Alfa-Beet and Dengie Performance+ Balancer with some extra Dengie Digestive Health Plus supplement to help settle his tummy. After a few days his droppings returned to normal and now he is on the same diet as the other ponies (Alfa-A Molasses Free, Alfa-Beet, & Dengie Performance+ Balancer) and looking and feeling very good. For now I am just hacking and schooling Smartie, he has been to one PC rally and behaved really well, and later in the year we will do some dressage and show jumping competitions and some XC schooling. 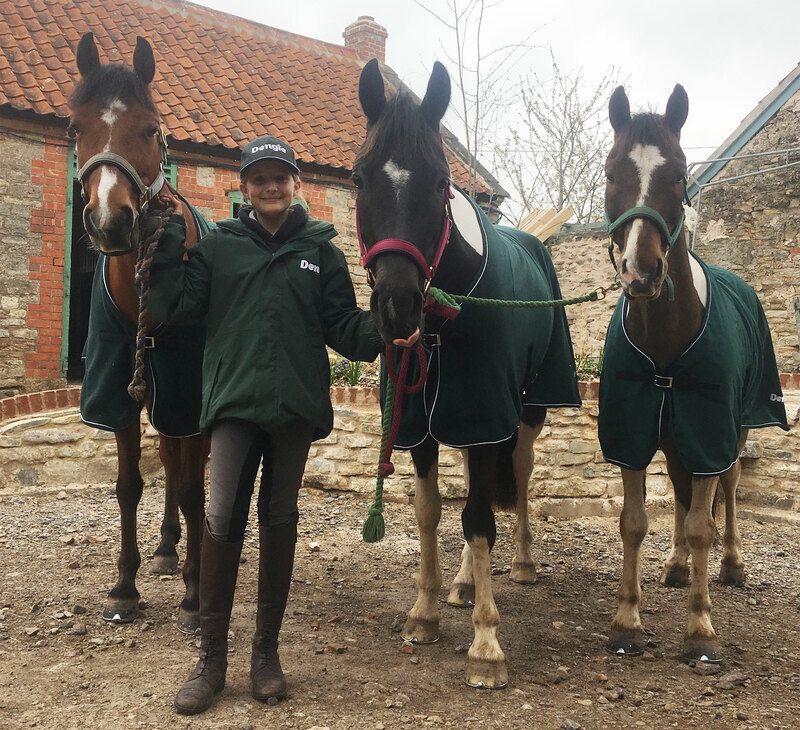 Felix and Chico have been busy getting ready for the eventing season and The Pony Club Dengie Winter League second rounds. After a winter of training with Chico I am starting to feel like we have turned a corner with him (he has been going through a very difficult and argumentative ‘teenage’ stage says Mummy!). 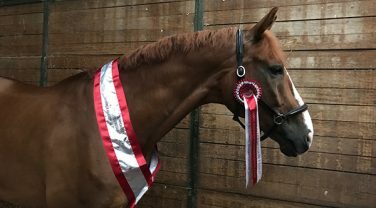 We have gone out to some British Dressage competitions and he has been placed in the top 3 every time with good scores so we are now qualified for a Pet Plan Area Festival. We have also been doing a lot of show jumping and XC schooling and he has finally over come his fear of steps. Now I am looking forward to our first event of the season and doing some British Eventing competitions with him all being well. Felix has been his usual amazing self! 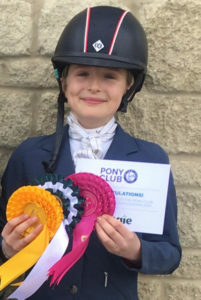 He had 2 busy days at The Pony Club Dengie Winter League Area Finals competing in both the novice and intermediate dressage and the Dengie Debut 80 and 90 winter league show jumping. It was really really windy on the day of the dressage competition and Felix did not enjoy it! He didn’t do a very good Novice test and sadly didn’t qualify for the finals. We decided to put his ear bonnet on for the Intermediate test and it seemed to help him settle as he did a lovely test to come 4th and qualify with a score of 68%. So me and Fe are off to Addington for the Champs once again and I’m so excited!! Chico also did both the novice and intermediate tests and he behaved really well doing 2 lovely tests and only just missing out on qualifying in the novice, I was super happy with him! The next day we went back with Felix to do the show jumping. He did a 2 lovely clear round in the 80 but was not quite fast enough so missed out on qualifying, but he still came 7th out of a lot of speedy ponies!! In the 90 he did another nice round but just had one pole down so no qualification but I was so happy with how he jumped. So now me and Fe are training hard for the Champs at Addington. The intermediate test will be in a 20m x 60m arena and as I haven’t actually ever done a test in a long arena before we took Felix and Chico to a BD competition so I could get used to riding in a long arena. The 60m centre line is a very long way on a 13.2 pony, but both boys did really well and Felix even won his class, his first BD competition, and Chico came a close 3rd! So now it’s practise, practise practise for Felix (although not too much as he gets bored easily!) and then off to the Champs in April, I can’t wait! !